Whew! I made it! I actually pushed through to finish a project – one that I’ve been working on for weeks! Rolling… rolling… rolling… hundreds… and hundreds… of magazine pages. 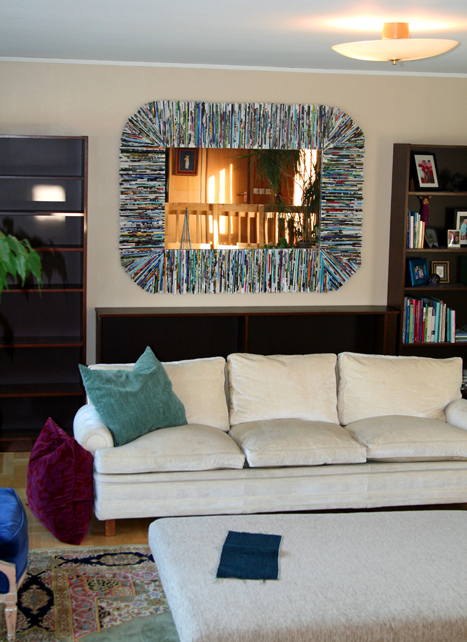 And now I have the pleasure of revealing my oversized mirror frame made from recycled magazines. Laurie, you were right with your guess from the sneak peek for this project! It was Diane at Home Sweet Homemade that first got me interested in creating something with recycled magazines – did you see her beautiful pic with the glass vase full of magazine beads? I was hooked! I first talked about this project on Facebook when my girlfriend (hi, Marie!) stopped by for an unexpected visit some weeks back…and started rolling with me while we caught up. She was even inspired to make her own recycled magazine frame, which I featured here on Blue Velvet Chair. The frame idea was inspired by this recycled magazine frame from Crafy Mamma that I’d featured in the 25 Repurposed Magazine Projects post back in July. Look closely behind the sofa in the photo and you’ll see I’ve turned one of my bookshelves on its side, after getting inspiration from this photo on Instructables. 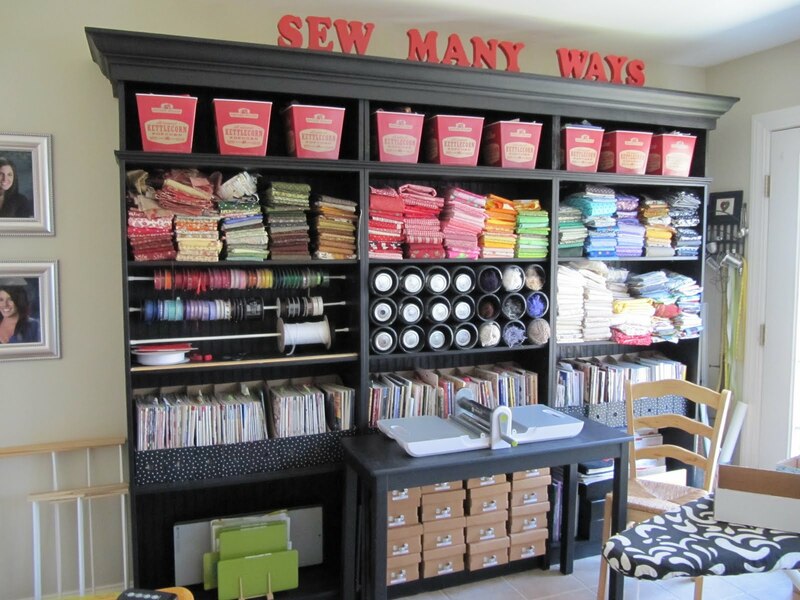 I’m also hoping to upcycle my boring set of 3 bookshelves – getting plenty of inspiration from the upcycle of these bookshelves from Karen at Sew Many Ways. And finally, there’s one more bit of inspiration I’d like to mention. Erin from Salvaged Grace recently attended a Blogshop conference, and she’s been having so much fun playing with her new blog designs…that I wanted to try my (amateur) hand at some photo layouts on this post. So, with all that credit going to everyone else, what am I most proud of? That I was able to draw on the creativity of others and create something for my home that is so true to ‘me’ – and I delight each time I pass by this space. In fact, I stop and stare a while – and it makes me happy. Are you decorating in a way that makes your heart sing when you step inside your home? Also linking to these fun parties, including The DIY Showcase. Hey, I don't know if I just missed it, but have you posted a tutorial for this? I have a great frame I would like to this to! How did you roll the magazines? With tape? And how did you attach them to the frame, hot glue or something? That's all I really need to know to get started! Thanks! What a fabulous mirror frame! I love the idea of it – great upcycle! I'm off to check out all the inspiration you mentioned! I plan to get a tutorial up next week (was supposed to have it up 2 weeks ago!). Check back and you'll soon be making your own creation! I love this blog! I just recently discovered it through a friend, and I'm obsessed. I super love this recycled mirror, but how did you do it? I didn't see any mention of how you rolled them and got them to stay, and then attached them. I'd love some input! What fun it is to get feedback on something you love! Thank you, everyone! @greenbabydesigns – I know how long it took me to roll each roll, and I'm going to count how many rolls there are on the mirror sometime this week. Then I should be able to tell you how many hours were spent just rolling the magazine pages. I know it took probably 6 or so hours to assemble it at the end. @I'm Busy Procrastinating – THANK YOU for the feature. It's always nice for others to connect with a creation, don't you agree? 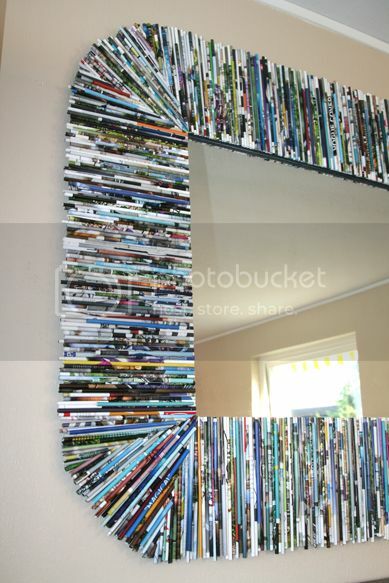 I think the SIZE of the mirror really makes it stand out from all the other upcycled magazine art out in blog land. 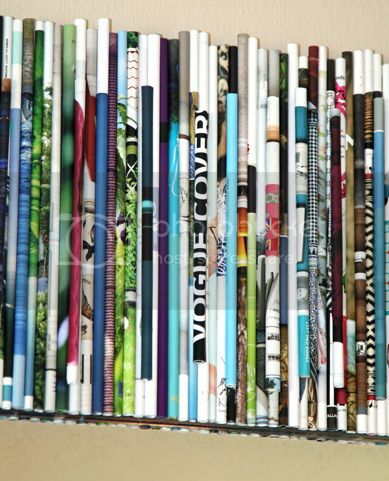 How long do you think it took you to roll all the magazines?! Very cool! This is amazing! I can only imagine all the time it took to roll those magazines. This mirror is simply fantastic! Wow! Michael, looks fantastic!!! I've been pleasantly surprised by how fun it is to create posts in Photoshop!! Glad to turn you on to it as well! And great job on the project, what an impressive undertaking!! Fantastique! That is so cool!!!! Great work. This looks amazing! I see these types of items in HomeGoods all the time… and I know that someone could knock one off. I can't imagine how long that took. But it looks fab! This is such a cool idea! You are so good! That looks AMAZING!! I'm so glad you stuck to it and finished it! 🙂 I can't wait to see it in person!!! That is so cute…and colorful! Good idea! This looks fantastic !! What an undertaking !! Can't wait for the tutorial !! Gorgeous, so proud of you for getting it up. At some point you will have to tell me how you managed it. Did you get that mirror from Vinden? Looks amazing. Great job. Can't wait to see the house. Hi Michael! Wow it's SO gorgeous! What a great idea! Thanks for linking up at Link Your Stuff again. It's allways great to see you there. its beautiful! great job! so inspiring!